There is unrivalled tranquillity and modern luxury awaits at this exclusive and contemporary “eco” designer villa on the still unspoiled and underpopulated Alonissos; a ‘secret’ and hilly (max 493 m) Aegean isle which, like Skiathos, Skopelos and Skyros is permanently inhabited, retains the appealing and natural charm of virgin coastal pine forests, untouched beaches and is devoid of mass tourism. The closest international airport is Skiathos, from which ferries and catamarans will transport you to Alonissos. In addition to the stunning Mediterranean panorama of unspoiled white pebble beaches and the first national marine park established in Greece (currently the largest marine protected area in Europe approximately 2,260 sq. km), the villa is unique in design and layout. 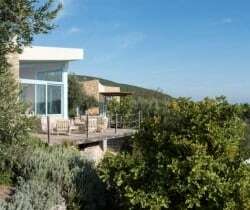 It is much like a secluded hamlet designed by a notable Italian architect and the property comprises four stone buildings with ventilated roofing that are literally secreted within more than 12, 000 sq. km of olive grove and fragrant strawberry trees, Aleppo pines, lavender and rosemary bushes. Near invisible from afar and blending into its surroundings, the modern building blocks are infused with charm, modern functionality and understated luxury within. There is warmth to the spacious interiors with chestnut ceiling beams and teak wood floors. The buildings also are spaced a short distance from the other to remain independent and immersed in privacy. Around the property paved stone walkways and steps navigate the extensive grounds where innumerable pleasures await. These include wood-decked terraces shaded by wild garden vegetation, a canopied and standalone sea view dining terrace, shaded barbecue areas and an exceptional swimming pool (25 m) that has extensive covered and open terraces, a chill-out area and bar. The six spacious bedrooms are confined to three buildings (2 in each) and all have an en suite bathroom, wide French windows and a private sea view terrace. The fourth building is devoted to communal living, kitchen and dining spaces extensively glazed for indulgence of the engrossing scenery outside. Ideal for 12 guests (but up to 18 feasible using available sofa-beds), this luxury one of a kind villa is modern, air-conditioned and comes with a dedicated off-site manager (fluent in 6 languages), 2 housekeepers, a chef with a kitchen team to ensure a first class and pampered stay. Another most appealing factor is the availability of a boat (for up to 9 passengers and with a captain) for excursions in and around the Marine Park. Here there are plenty of opportunities to swim and snorkel in the warm and turquoise, crystalline sea, to discover secluded beaches and hidden bays and to catch a glimpse of dolphins and the other rare marine wildlife. Providing an overwhelming sense of comfort, convenience and privacy, the island and property will be appreciated most by travellers seeking an indulgent island escape of rest and relaxation. 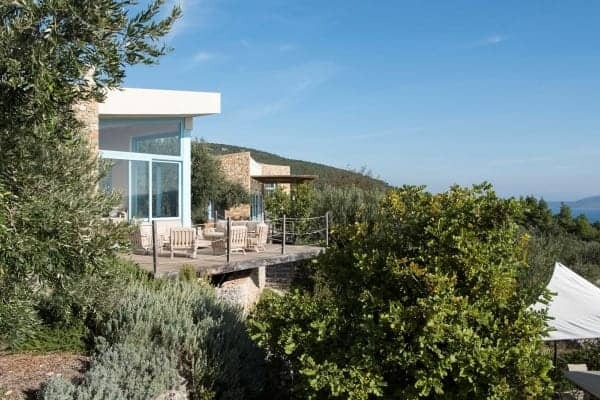 The luxury villa may be enjoyed by a large (mature) family, or a group of couples or individual friends wishing to recapture the natural rhythms of life well off the more beaten path of the Greek isles.